Loopy Lights is the thirty-second level in Donkey Kong Country. It is also the fourth level of the Chimp Caverns area. In the Game Boy Color version in Donkey Kong Country, this level is instead the thirty-third level, as well as the fifth area in Chimp Caverns, as a result of the added level, Necky Nutmare. Taking place in a mine, this level is similar to Stop & Go Station, another mine level, as the Kongs have to hit barrel switches to keep the lights on in both of them. This time, however, Rock Krocs, enemies found in the first mine level, are not present, and the lights have to be kept on simply so that Donkey Kong and Diddy Kong can see. Throughout the whole level, the mine shaft's lights are turned off, so they have to hit 'Off' barrels to put them back on for a short period of time, or otherwise not be able to surpass the hazards found in the area with a clear view. The job is not made easier here either due to the wandering Kritters and Zingers blocking the way, as well as the jumping purple Klaptraps. There is also a Manky Kong at the end of the level blocking the Kongs' progress. 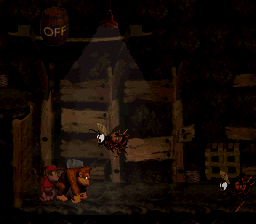 When the level begins, the Kongs find themselves under a barrel switch that displays the word, "Off." If they hit it, the lights turn on, putting a purple Klaptrap near a ledge in view. Another barrel switch can be found on the top of the ledge just before a small pit with the third barrel switch on the other side of it. As the Kongs approach a DK Barrel near here, a purple Klaptrap marches towards them. They find another one of these Klaptraps shortly after here next to another barrel switch that can be used to illuminate the area for a limited amount on time. The primates can find a pit containing a moving platform ahead. They can use the platform to cross and access an area with another purple Klaptrap and a barrel switch. The Kongs travel in the dark. Another wide abyss is ahead, but the Kongs can cross it with the aid of two small platforms that move across it. On the other side of the pit, they can find a barrel switch and a purple Klaptrap, who is followed by a smaller abyss containing a stationary platform with a tire sticking out of it. The Kongs encounter two more purple Klaptraps on the opposite end of the pit, and a tire sits between them, which can help the two primates bounce to a barrel switch high in the air. Six small platforms float in an abyss near here. The primates can use the stationary platforms to cross the wide pit and access an area containing a barrel switch on a high piece of ground. Purple Klaptraps march nearby at a lower elevation, which is followed by a small pit with another barrel switch above it. Several large, solid platforms stand ahead of here. The first of the platforms holds a group of bananas, while the letter O can be found between the second and third platforms. A few purple Klaptraps also travel through this area, which is followed by a long pathway leading to a barrel switch and the level's Star Barrel. A barrel switch is placed immediately after here that can be hit to activate the lights again, as hitting all other barrel switches in the level does. After dropping down a small ledge near here, the primates encounter a Kritter hopping over a small alcove in the ground, which contains a DK Barrel. A raised piece of ground with a tire and a Kritter on it can be discovered next to a nearby barrel switch. The heroes can push the tire under another barrel switch found high in the air and then bounce on it to reach the most recently discovered switch. An abyss is ahead that can be crossed with the assistance of a small, moving platform that hovers back and forth over the whole pit. The primates can find a couple of purple Klaptraps in the area ahead of here, which also contains another barrel switch that floats near a small pit. On the other side of this abyss, the Kongs can find many small ledges that they must climb to reach the top of a pyramid-like structure. Diddy Kong runs down a few ledges with a barrel in his hands. At the top of this area, a Necky on a barrel switch can be found, along with a simple barrel that can be used to defeat enemies or open secret areas. Several more ledges that lead to the bottom of the pyramid-like structure are ahead, and a small pit is at the bottom of them. The heroes can find a barrel switch and a raised piece of land with a purple Klaptrap on it on the opposite side of this pit. More purple Klaptraps march near the next barrel switch, which is followed by an abyss that can only be crossed with the aid of two small platforms in it that move back and forth in a vertical path. A Kritter can be found on the other side of the pit near another barrel switch. Four tires are located after here in a wide abyss, each with a tire on it. Using the platforms, they can cross in order to access an area containing a high piece of land with a barrel switch at the end of it. The duo can find a long pathway ahead of here consisting of a great extent of Zingers that float in place and move. The letter G is located behind one of the Zingers, who is followed by two more of the wasp enemies and a barrel switch. After crossing a small pit that follows this area of Zingers, the primates can find a sign that indicates that the level is near complete and several small ledges. Several barrels being thrown by a Manky Kong found ahead roll down the ledges as the heroes climb them. They meet the Manky Kong under a barrel switch at the highest ledge, which is followed by a small pit. When the Kongs cross it, they land on a raised piece of land with another barrel switch in front of it. Once the Kongs drop down the raised piece of ground and travel slightly farther into the level, they come up to an exit sign and a small tunnel that leads out of the level. A purple Klaptrap guards the exit. Manky Kong: 1 in the SNES and GBA versions, three in the GBC version. K: The Kongs can find the letter K at the end of the level's first Bonus Level. O: The letter O is located in a small gap shortly before the level's Star Barrel. A super-jump is required to reach it safely. N: The letter N is placed on the edge of the second platform in the level's final Bonus Level. G: Near the end of the level, the Kongs enter an area full of Zingers. The letter G is around one of the Zingers, who moves in a vertical path. When the Kongs come up to the level's first pit, they should see a banana sticking out of the bottom of the screen. They should drop into the pit and be caught by a barrel, which shoots them to the first Bonus Level, where they can hit a barrel to activate the lights. Afterwards, they have to jump into another barrel and blast through a long chain of several more barrels, collecting a few special items, such as the letter K, on the way. At the end of the area, they can walk into a small opening to exit. At some point in the level, the heroes meet a Necky. They should defeat the foe and pick up a normal barrel under it. They should then carry it over a small gap and past a purple Klaptrap to a small wall. After they blast away the wall, the two Kongs have to walk into the newly created opening to enter the second Bonus Level. There, they need to hit a barrel to turn the lights on, giving themselves a clear view of the area. After this is done, they can discover many solid platforms ahead of them. As they climb the platform, they come past a few collectibles, such as an Animal Token and the letter N. After bouncing on a lone tire, the group can find the bonus's exit. At the beginning of the level, Donkey and Diddy Kong should head west to find a photograph behind the entrance. It gives them a group picture of themselves in a mine shaft. The picture can be found on the sixteenth page of their scrapbook once they collect the photograph. In the Japanese version of the game, an extra DK Barrel was added near the level's first Necky. In the SNES version, the level uses the boardwalk background, while in the GBC and GBA versions the level uses the mine background. This page was last edited on April 9, 2019, at 20:46.